Earlier this year, Get Satisfaction launched a Facebook application that brought the popular customer support service to the world’s most popular social network. Today, competitor UserVoice is launching an application of its own that offers many of the same benefits. The app will allow businesses to poll users on which features they’d like to see implemented and ask if they’ve had any issues — with the data getting relayed back to the business’s UserVoice web presence in real-time. The appeal of these Facebook applications is obvious: brands and businesses are investing significant resources into developing their Facebook pages as a way to interact with their customers. 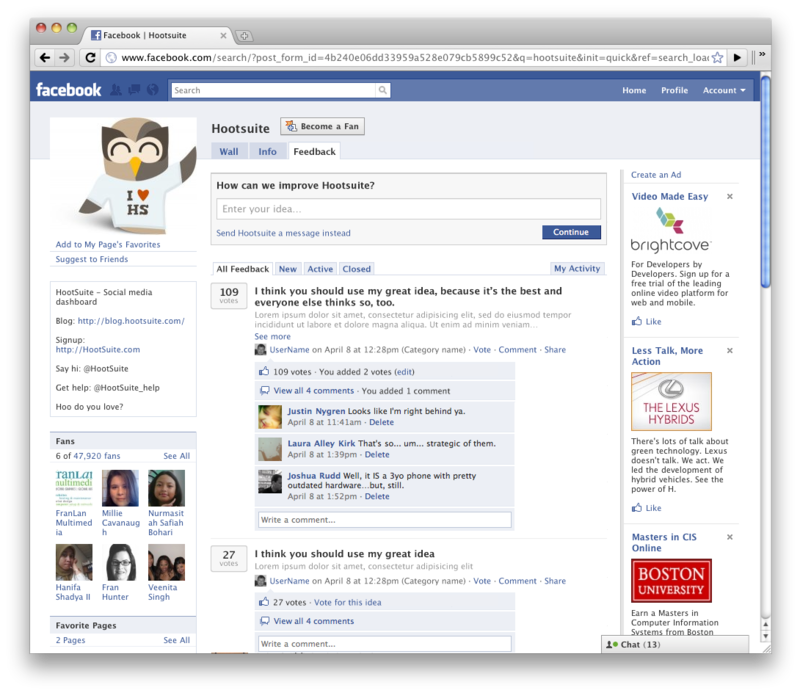 If they want to get customer feedback on upcoming features or offer user support, it makes sense to do it directly from this same Facebook Page rather than redirect them to another site. The UserVoice Facebook application will be available for free through the end of the year; it will then shift to a premium feature available for UserVoice Bronze customers and higher (the Bronze plan runs $89 a month). If you do get it during the free period, you’ll have it grandfathered in and won’t have to jump to a premium account. 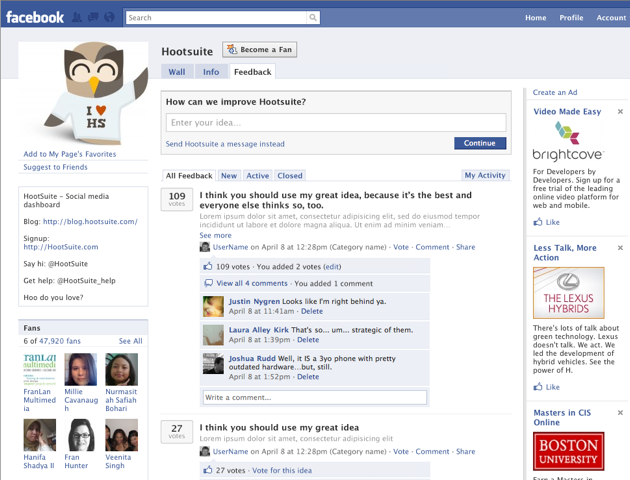 You can see a demo of the app on the Hootsuite Facebook page. UserVoice is launching the app via a partnership with TC Disrupt Finalist AppBistro, though the application won’t be distributed exclusively through their marketplace. UserVoice also recently launched an iPhone application and a new API (which is powering both the Facebook and iPhone applications).